These were done as an entry for Daring Digit’s Beach Day nail art contest. I'm posting these on here kind of after the fact, but I won third place! I never win anything so it made my day when I found out! My ideas for what I would do changed about a hundred times, but I’m pretty happy with how they turned out. :) I think the umbrella nail is kind of awkward color-wise but I really love all of my other nails, especially the starfish! The starfish were really easy too, I just used my favorite tiny paintbrush to make the arms, making sure to start at the middle so the tips would be thinner. Fun Fact: My boyfriend thought the bikini was a smiley face made out of bananas before he expanded the picture. Today I'm showing you Metametics Airbender and I would be lying if I said I kept a completely straight face when opening up the package that had this polish in it. I was like a little kid at Christmas! Airbender is a blue based polish with small and medium glitter in both white and blue. My middle and pinky fingers have two thick coats and my thumb and index finger have three thinner coats. At first I thought I may have to dig a bit for glitter, but that turned out not to be the case at all! I also didn’t have to do too much fussing with the glitter to get it placed where I wanted, which is always a plus. :) I wouldn’t really say that the base is a jelly, it’s more like a sheer creme, but you still get the depth of glitter under the layers of polish. On my ring finger I did the arrow tattoo that the Airbenders have. How about some bottle shots? Airbender can be purchased here in mini ($4) and full ($10) sizes. This product was provided to me for review. All opinions expressed in this post are my own. I've already raved about Pretty and Polished Valentino before, but for whatever reason I haven't used it since I got it! Well.. the reason could be because I only bought a mini and I never want to run out! So I've decided if I'm gonna use my indies I have to at least do some sort of nail art with them! On my right hand I made stripes using striping tape and on my left I did polka dots! For the polka dots I just used a bobby pin an acrylic paint. So someone that I've recently become (slightly) obsessed with is Tyler Oakley. He has an amazing YouTube channel and I also love his tumblr. He has a line of t-shirts and posters on District Lines which I think are really awesome and so I used them as an inspiration for nail art! I'm really happy with how these turned out! 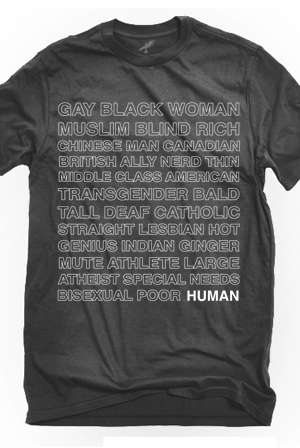 I like that everything else is faint except for 'human', which is nice and bold. :) For these I used the newspaper technique. What you do is take something with print on it (usually newspaper, hence the name), cut it into smallish pieces, then dip it in alcohol (I use rubbing, but some will just use vodka) then place it on your nail and apply pressure. When you peel it off the ink should have transferred to your nail. Some may say to just dip your nail into the alcohol. I actually find that doing both gets the best results. A lot of people have asked me how I got the words to not be backwards, and all you have to do is reverse the text before your print it out. :) So if you want to do something like this for yourself make sure you either have an image or you have your text done as word art!